Do you think the MC cartridge will see 100ohms? It should be small (i.e. <1kΩ) but without a detailed circuit analysis I couldn't say for sure. You might want to measure it seeing as how it's already in build. That always yields the definitive answer. How would you suggest I measure it? Simple. 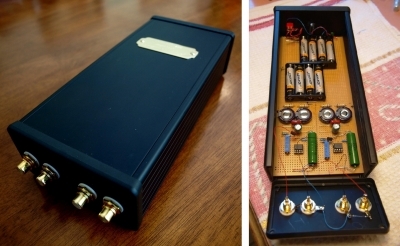 Grab a signal generator and a dual trace oscilloscope. Wire up the following setup. V1 and V2 should be measured with the dual trace oscilloscope. Follow these steps. 1. Set the signal generator for 1kHz and zero voltage output. 3. Record V1 and V2 peak voltages and phase differences. 4. Repeat for a couple of different input voltages. The magnitude of the input impedance is equal to the ratio of the V2/I which is equal to 100*(V2-peak/V1-peak). The phase of the input impedance is equal to the phase difference between V1 and V2. You do it at a few different signal magnitudes to make sure you've got a good view over the input range of operation. If the preamp input is biased off of 0 volts you may need to capacitively couple the signal generator with an appropriately large capacitor. Finally the Hiraga MC preamp is complete and in the bag (case). Ok this time a project didn't go first time but after a couple of re-inspections I worked out the right channel had a ground on the output of the output cap. The left channel worked straight-up but dead in the right. All voltages across the left and right chips were the same so I knew it was something simple. Now it works but it may be a day or two before I get a big listen and compare this MC preamp to the Le Pacific(s) I have been building lately. I wondered if the input offered a 100ohms resistance to the cartridge. On first listen I would say the load to the cartridge sounds about right but Matt's simple test should prove that. It looks great, hope it play well, hove long du you estimate the battery life time,on this baby? I should have taken a few voltage reading across resistors so I can calc. battery life. I will do that and post the results. The AAA are rated 1000mAh with a drain of about 10mA. The Le Pacific MC preamp draws 15mA and I would expect better than 50 hours of use. If battery changes are too frequent I can move up to Lithium batteries. I took some voltage reading around the cct. to try to calc. total current draw. If my figures are correct this MC preamp (at idle) draws an incredibly small amount of current. Look back to the schematic to see the resistors I measured voltage across and see if you agree with my result. As I have said the current drain is very low. For me this totals for both channels 3.7mA which would give over 200 hours of use on a single set of cheap batteries. Just for interest I measured the voltage across the 6.2K resistor which will have a small amount of bias current added to it. Voltage across the 6.2k is 6.1V. Here is the Hiraga bipolar MC stage in the long Hammond enclosure. Not much to see: for gold plated RCAs on the back and an on/off switch and blue led on the front. The bottom of the enclosure is lined with bitumanised Al foil to add weight and case dampening. Hanging-out for a big listen tonight with my new DJ-3565 TT and AT MC cart. Spent the night listening to the new MC preamp. The sound stage was incredibly deep and detailed but not all the wide on two LPs. The speakers "sounded" like they had nothing coming out of them. they just vanished. On the next two LPs the speakers can back and sound stage was just as deep and details. All LPs are very second-hand so it may just be differences in the vinyl quality. But what I heard I liked a lot. This MC preamp, I believe, way outperforms the Le Pacific for sound stage depth and detail and has extended dynamics. Though harder to construct and more expensive it is well worth the effort.